From Ḥannibaʻ(a)l meaning "Ba'al is/has been gracious" or "Grace of Baal"
From ʼDNBʻL ʼAdnibaʻal, meaning "Ba'al is my lord"; in গ্রিক: Ἁννίβας, Hanníbas. 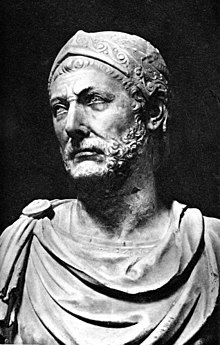 ↑ Hannibal's date of death is most commonly given as 183 BC, but there is a possibility it could have taken place in 182 BC. ↑ Lancel, Serge (1995) Hannibal cover: "Roman bust of Hannibal. Museo Archeologico Nazionale. Naples"
↑ Goldsworthy, Adrian (2000) The Fall of Carthage cover: "Hannibal in later life"
↑ Goldsworthy, Adrian (2001) Cannae p. 24: "a bust, which may be a representation of Hannibal in later life, although there are no definite images of him"
↑ Goldsworthy, Adrian (2003) The Complete Roman Army p. 41: "a bust that purports to show Hannibal in later life"
↑ Matyszak, Philip (2003) Chronicle of the Roman Republic p. 95: "bust, thought to be of Hannibal, found in Capua"
↑ Friedrich, Johannes, Wolfgang Röllig, Maria Giulia Amadasi, and Werner R. Mayer. 1999. Phönizisch-Punische Grammatik. P.53.